At the edge of a lovely village in the south Minervois of the Languedoc, right alongside the spectacular Canal du Midi & only 15min away from the famous walled Medieval Cite of Carcassonne. Both are UNESCO World Heritage Sites. We offer 2 fully equipped independent gîtes each sleeping 4 + Cot, which can prove to be an ideal base to explore the many attractions in and around the area. HEATED SWIMMING POOL 10m by 5m (32 x 16ft) with Roman steps for easy access. (May - Oct) Both gîtes share the relaxing pool which is set in approx. 2 acre garden. Sun lounger’s are provided around the pool on the decking and tiled surround, offering spacious sunbathing area with extensive views of the hills and vineyards. Private off road parking in gated garden. 2 Independent gites with own patios for BBQ and sunbathing. Ideal location for visiting the many attractions or just soaking up the sun. The Mediterranean Sea and beaches are 40min drive. 2 Independent 3*** gites with private patios, garden furniture,and large stone BBQ. Well equipped with all essential items provided. Dishwasher, Washing Machine, Microwave, Induction Hob, Electric oven, large Fridge/Freezer, kettle, coffee maker, Toaster, Cool Box, Flat screen TV, DVD player, Radio/Hi-Fi. Free Wi-Fi, docking station for iPod/iPhone. Large modern showers in each gite. Clean, well maintained, freshly laundered bed linen & towels. We can provide Pool / Beach towels if you wish to save on luggage. Our property is right alongside the Canal du Midi and great for walking or just sitting and watching the boats go by on the Canal du Midi. Supermarkets and shops are a short drive away but the village has a wonderful Boulangerie selling different breads, cakes and a selection of groceries. Golf breaks: Carcassonne has, a beautiful 18 hole Par 71 - 5,758 metre golf course playable all year round with views of the Pyrenees and which is only a 20 minute drive away. Nice hosts, with good local knowledge. Comfortable and clean with good facilities. Good location for exploring or just relaxing by the canal or on the terrace with a BBQ. We are so glad you enjoyed your stay and hopefully the house hunting went well. We are so glad you all had a lovely holiday. We spent a lot of time decorating the Gites and making sure they had everything for the guests. Your comments mean we got a lot of things right. A great position near Carcassonne and the coast amid a huge wine growing area. We are so glad that you had a lovely stay and enjoyed your time in Canal View and all the area has to offer. It is always nice to hear that guests have enjoyed their time in Canal View. It was lovely to meet the 2 of you. It was a shame your son was injured before the start of the U20's Rugby World Cup, so you were not able to enjoy the thrill of him playing for England in the competition. My husband and I are traveling in France, Spain and Portugal for 2 months and we have about 2 weeks left of our amazing vacation. Languedoc Holiday gites was by far our favourite- I was sad to leave and truly hope we may be fortunate to return again. Our hosts Adrian and Anne-Marie are wonderful- helpful with suggestions on sights to see, routing concerns, restaurant recommendations, wineries to visit, anything we asked they were more than happy to try to accommodate. The gites are lovely- so cosy, spacious, clean, well supplied, decorated tastefully. The beds are the best! The location is fabulous- directly across from a lock on the Canal du Midi- a great source of entertainment. It was very peaceful, we had the best sleeps. I can’t recommend it enough. Merci beaucoup to Adrian and Anne Marie for helping to make our holiday so special. Spent a relaxing short break in Canal View. Each day started with a short walk along the canal to the local boulangerie, followed by a coffee opposite. Ann-Marie and Adrian made us feel very welcome. The house was just perfect with easy links to Carcassonne and pretty Aude villages. Plenty of room for 4 persons and a complimentary bottle of wine. It was great to meet you all. We hope your house hunting goes well. It is a lovely area to both live and holiday. We look forward to welcoming you back if you are in the area again looking for your ideal holiday home. The village of Marseillette is close to Carcassonne in the southern Minervois region of the Languedoc. 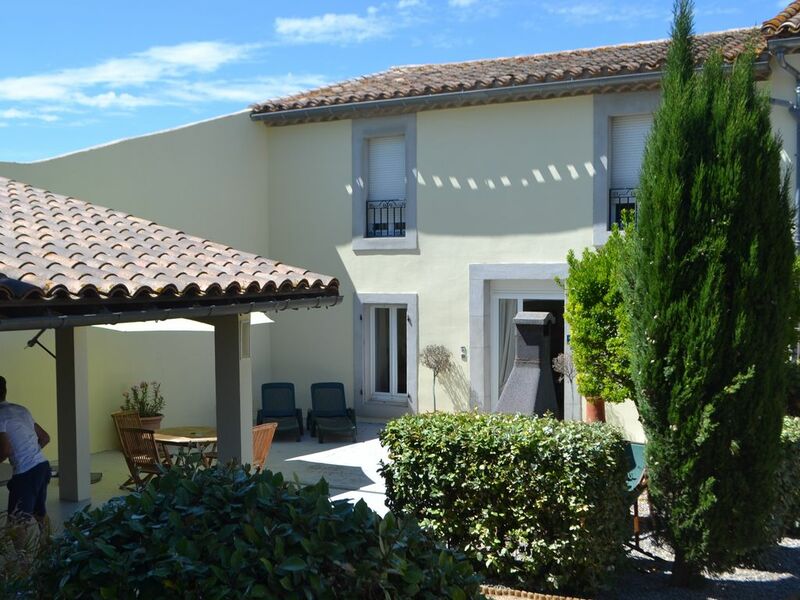 It sits between the Canal du Midi and the river Aude. A typical French village with a population of around 700, following alongside the Canal du Midi which is extensively used by hired boats & privately owned yachts and barges. It's a fabulous location for seeing the area or if you need your batteries recharging then you don't need to travel too far to see authentic French life. We have a wonderful Boulangerie, bar, hotel & hairdressers in the village. The property is at the edge of the village and virtually surrounded by vineyards. The local industry is wine making!! Plenty of picturesque places to visit close by and historical sites. If you like walking, sight seeing, bird watching or wanting to just sun bathe then everything is here. Trebes close by, offers all the necessary facilities such as; Grocers, petrol, supermarkets, chemist, newsagent, banks etc. All major stores and supermarkets are found in Trebes & Carcassonne. There is a mini supermarket in Capendu only 2 kms away open 6 days a week and sells most items. Marseillette is a great base for exploring the beautiful countryside and discovering new local wines. Cathar history, Beziers, Minerve, Caves / Grottos, Narbonne & the Mediterranean Sea, Spain are all close by. Golf: Carcassonne has a beautiful 18 hole Par 71 - 5,758 metre golf course playable all year round with views of the Pyrenees and which is only a 20 minute drive away.